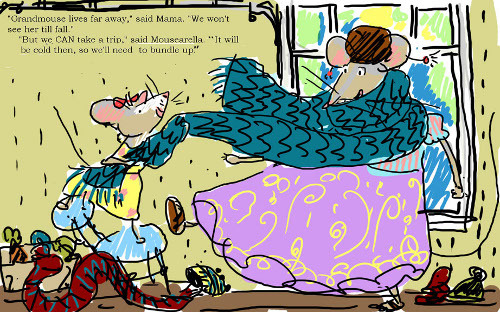 David Ezra Stein’s Love, Mouserella—released in September from Nancy Paulsen Books/Penguin and recently named a Kirkus Best Children’s Book of 2011—is told from the point of view of young Mouserella, who is not happy about her grandmother’s departure. 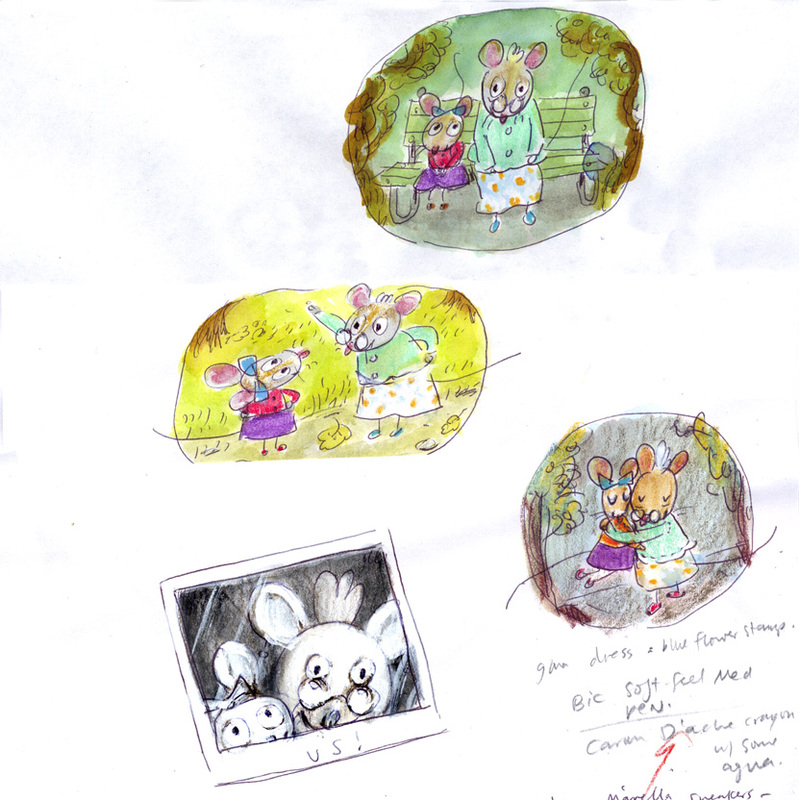 She takes her mother’s advice and writes a letter to her Grandmouse, giving her a recap of what’s gone on since she left for the country (including an exciting loss of electricity in their home, making this one of two memorable picture book blackouts this year). She also fills her letter with the types of meandering details to which young children pay great attention. (“I don’t know what to write . . .” she starts. “Guess what? My beaded belt is almost done now.”) In fact, the entire book captures so accurately the train of thought of young children — er, creatures. 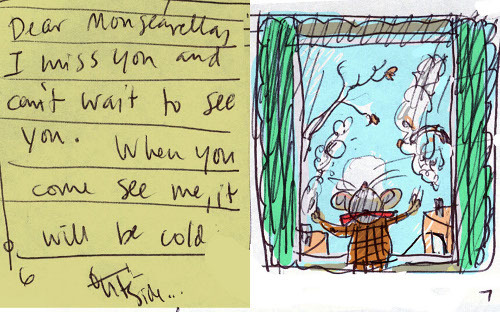 “Mama says we won’t come see you till the leaf falls off our oak tree,” she writes at the book’s close, Stein nailing the ways in which really young children mark time (there’s also “till….me and Ernie go to school”). She also sends along things like a pack of ketchup, a picture of herself smooching the camera, and lots of doodles and drawings. Stein uses a cheery pastel palette on this one, and the book is vertically oriented, as if to open up like a letter one receives in the mail. Indeed, the spreads are marked with lines, as if Mouserella is writing on school notebook paper. David’s here this morning to share some development art and talk about the evolution of the book — and its charming protagonist. I thank him for stopping by. 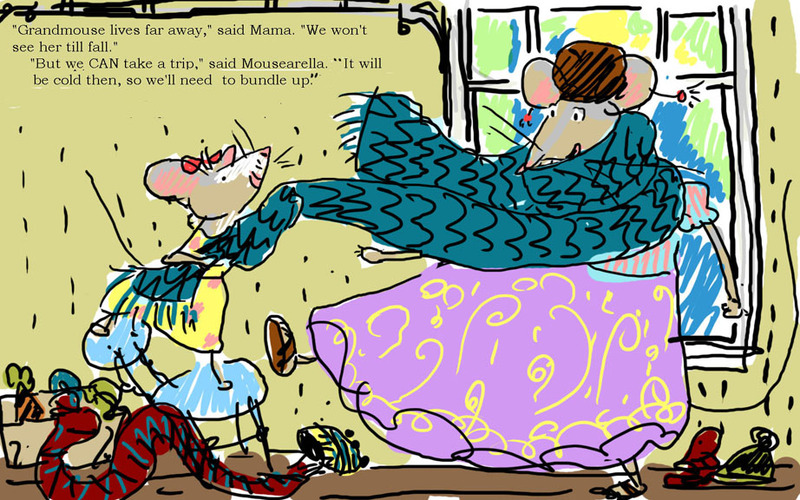 “The book began with the idea of a young mouse taking an imaginary trip to see her Grandmouse. She goes on a train from city to country. 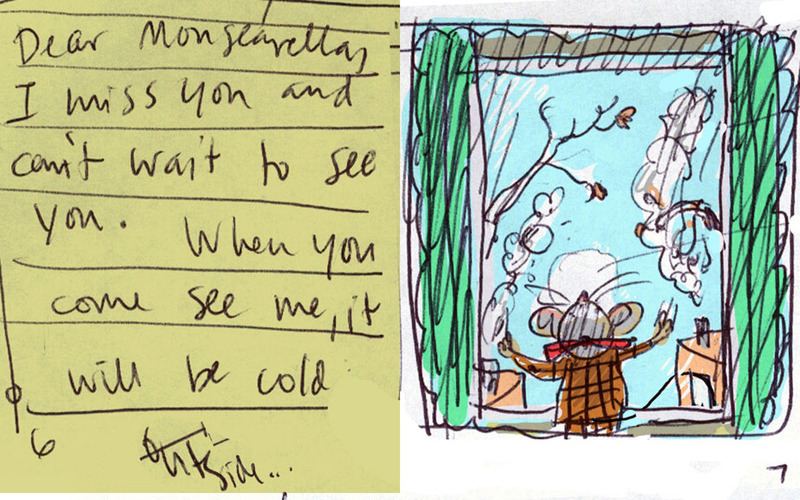 Grandmouse has written her a letter, which serves as a guide for what she’ll do on the trip. 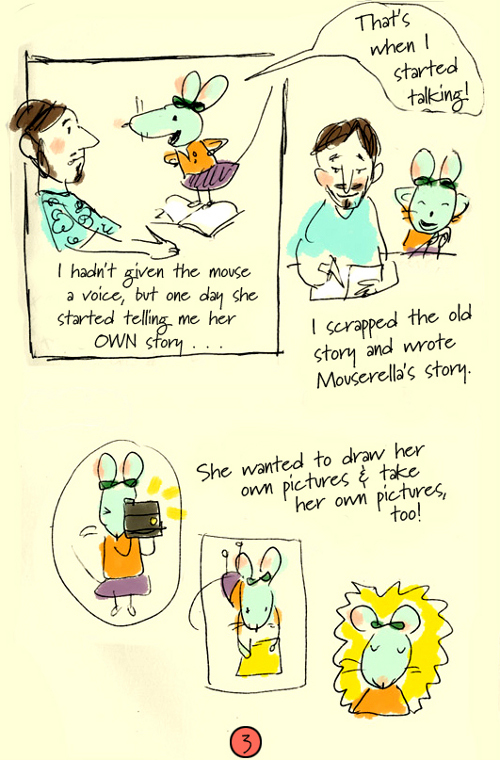 Somewhere along the way, I realized Mouserella wanted to tell me her story. She wanted to be the one writing the letter, and thus the book came into its own. My first sketches are always gestural. After drawing it all out in black and white, I began to look for a style. Finally, I painted this mouse. I loved the technique and the pizazz of the mouse. 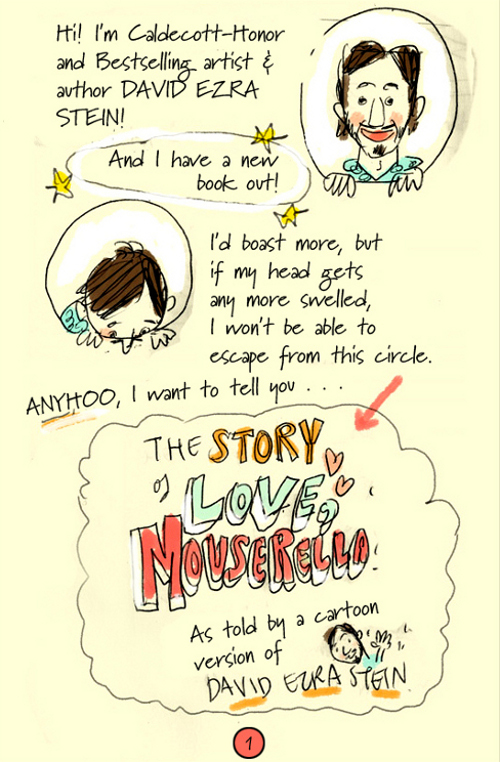 LOVE, MOUSERELLA. © 2011 by David Ezra Stein. Published by Nancy Paulsen Books, a division of Penguin Young Readers Group, New York, NY. All Images reproduced by permission of David Ezra Stein. 2) I enjoyed two days of doing no work and doing no blogging and doing no freelance writing. While I enjoyed lounging around and while I’m hardly so type-A that I don’t know how to relax, I also rather missed … well, all the stuff I mentioned. I’ve always been the type of person who creates work for herself if there is none and is always doing seven projects at once, so yeah. Anyway. I guess I like to be busy. 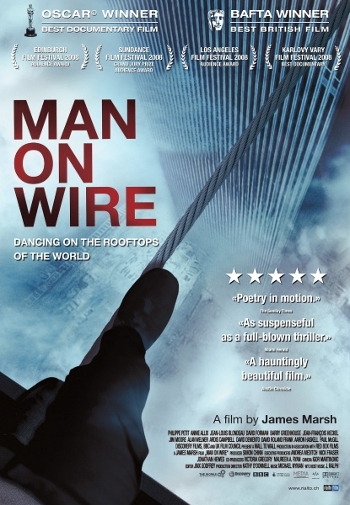 3) On one of those lounge-y, do-nothing nights, I decided to kick back in the comfy living room chair I am usually too busy to kick back in and stream the documentary Man on Wire, about which I had heard good stuff. It’s the story of Philippe Petit (the subject of this beautiful Caldecott winner). And it is so unbelievable the INCREDIBLE BALLS this man has that I was muttering audibly to no one else in the living room incredulous things which involve curse words I can’t repeat here, as well as a few “but, no! SERIOUSLY?”s here and “but no no no way ARE YOU %&*!# KIDDING ME?”s there. I didn’t determine it the best documentary I’d ever seen, by any means. I mean, it was okay. This isn’t necessarily a kick, I guess. It’s just noteworthy, I suppose, what balls of steel this man has. That is all. I’ve said “balls” in one form or fashion about three times now. Make that four. Sorry. I’m classy like that today. 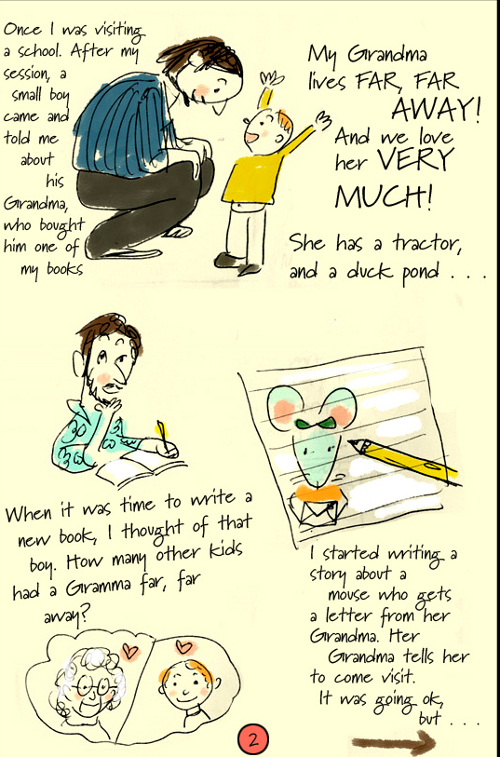 4) I love all the art Rafael López shared at 7-Imp on Wednesday. He even gave me permission to use his sun on this page of the site, ’cause I love me some good sun images. 5) My friends. And my Circle of Word Lovers. 6) The health and happiness of my children, whom I find neat and interesting and enjoy talking to. I hope it’s okay to share this image, which I saw on Facebook. It comes from Old Made Good in Nashville, which has great stuff, such as this and these. Actually, I’m not sure if they created this poster or were just sharing it. Facebook Confusion! Anyway. What are YOUR kicks this week? How wonderful that the small boy at the school visit and then Mouserella began talking to David Ezra Stein who–importantly—listened to what each had to say. I look forward to reading the whole letter (book); it seems a nice combo of sweetness and pizzazz. Jules – I’m writing this at midnight PST, having just returned from a screening of HUGO. Yes, wasn’t it beautiful, nostalgic and moving? Funny… this week turned out to be film-history week for me. We saw Cirque du Soleil’s IRIS at the Kodak Theater yesterday, and it too had George Melies footage incorporated into the performance, and similar stylized costuming and acting. I enjoyed both IRIS and HUGO immensely, and back-to-back, even better. RE: Man on a Wire. The spectacle of the wire walk was mind-blowing. But wasn’t it sad how Petit let the fame of that crossing go to his head and didn’t really acknowledge his crew, his girlfriend or co-conspirators who risked jail time for the trespassing and vandalism required for his feat? I mean, they financially, figuratively and literally supported him—practicing, engineering, rigging the wire, filming the walk. And then he hogged the accolades. And years later, having lost most those friends, he discounted the same group AGAIN during the filming of the documentary. It was fascinating to watch that repeated failure play out. Made me wonder if the big balls, tight focus and huge ego it took to do the walk predestined Petit’s downfall as a person. I felt bad for him and his old crew as well. Still, gasp, those last 15 minutes are thrilling. 2. HUGO on the screen with lots of my favorite things: film-making, toys that move, books to the ceiling, clockworks, invention and compassion. 6. The carrot/apple/curry soup my 16-yr-old son fixed for Thanksgiving. 7. Good ole family stories that we all laugh at every time they’re told. 1. Mexican food for Thanksgiving! We are not big turkey fans and it was just the three of us and the enchiladas were fab. The parade was also great. 2. Trans Siberian Orchestra last night in Seattle. AMAZING! My son was thrilled to pieces – this is a holiday tradition for us and they do not disappoint. 3. Just got word that THE MAP OF MY DEAD PILOTS (my book) is a Booklist Editor’s Choice for Best Books of 2011. Wowsers. Didn’t expect this at all and it’s so great to be noticed by librarians! 4. Speaking of which – Liz wrote the kind of review at A Chair, A Fireplace, A Tea Cozy that authors dream about. She got my book, really got it, and that is the best sort of reader to find. 6. HEMINGWAY’S BOAT – totally lives up to the hype. 7. Winter winds are blowing as I type this; I love this time of year, absolutely positively love it. Have the best week ever you guys, good wishes all around. 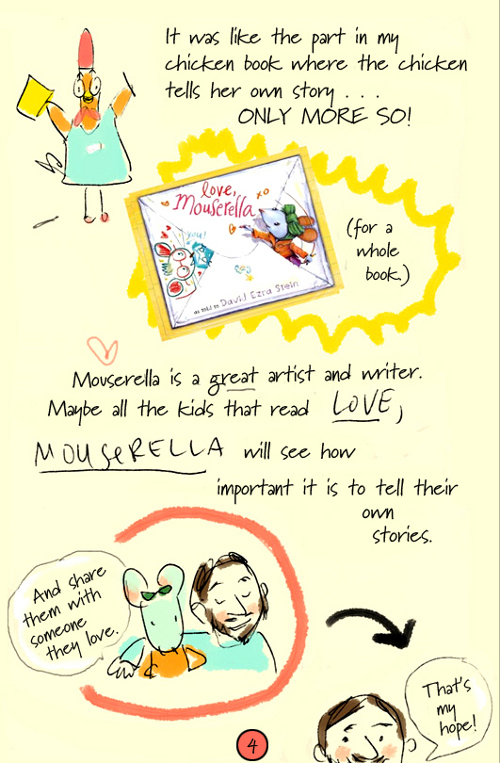 I am really looking forward to seeing Mouserella, and David’s story about making the book makes me want to see it even more. 2. I saw three movies this week: The Descendants, The Muppets, and Hugo. All were excellent. 3. Thanksgiving dinner at my house was lovely. I didn’t get stressed out about anything and managed to enjoy myself. Sometimes I can get a little uptight about entertaining, overworrying it all. 4. I’ve given up overworrying a lot of things over the last couple weeks, it seems. I hope that sticks around. 5. My dear friends and family (who I should have mentioned at NUMBER ONE, right?) who make my life interesting and fun and worthwhile. 6. I’ve been watching season one of Modern Family, which I am totally late to the game on, but WOW that show makes me laugh. Laughter, in general, should be a kick. It’s amazing to me how something really good and funny can turn a day around. Denise and Adrienne, re Philippe: YES. I mean, dude at the end crying? Crying so hard he could hardly speak? Just sad. That clearly screamed: Broken friendship. Yes, I totally saw that, which is why I made sure to type “arrogant.” ‘Cause you get that vibe from him. Denise, wow, to the green flash. The link you shared says it’s rare to see one. And I have never even heard of it. … So glad you had a good holiday with your family AND soft dinner rolls. I looked down at our meal on Thursday and realized it was 99% carbs and starches, but ah well. It was good. …. And, man, IRIS looks soooo good. I’ve never ever seen a Cirque show. Colleen, CONGRATS on the Booklist news! That is excellent. And I love your idea of a Thanksgiving dinner. We’re not turkey people either, so we went meatless this year. …Haven’t heard of Hemingway’s Boat, but it sounds good. Adrienne, I saw that video earlier (did you send it to me? Ah, the sensory overload of modern life), and when he rattles off his reasons to do comedy and says he can do “crazy characters,” I laughed the hardest. I gotta see Modern Family, I really do. … So glad your Thanksgiving was good and warm and full of friends. I embedded everyone’s videos to make it easier for others to see — and ’cause they’re both so good. Hope that’s okay. Must. have. 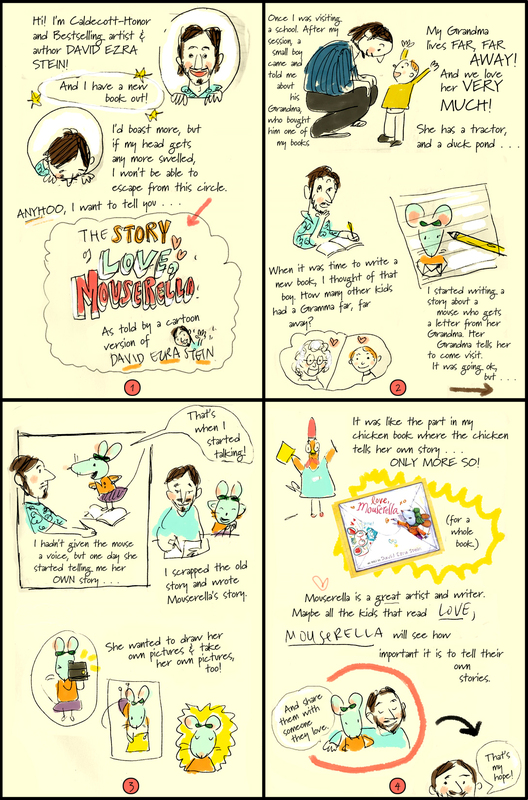 Mouserella, what a darling story especially his inspiration. Jules, Hugo and Man on a Wire are on my to see lists. Denise, the new camera looks interesting and the soup sounds divine. Colleen, congrats on your book making the Best Book Choice. Adrienne, time with famiy is the best. 2. Time with oldest grandgirl. 3. Chuck being safe after interrupting a robbery at our house. (and nothing was taken as well). 5. Talking to long distant family/friends on Thursday. 6. Crazy midnight shopping with daughter and her older stepdaughters on Thanksgiving. 7. Writing at an awesome loval library. Jone, robbery? Oh no. Thank goodness Chuck is safe. Did anyone nab the intruder? Thanks to David Ezra Stein for sharing so much backstory. I particularly enjoy seeing that, while some of his initial sketches are done with the aid of a computer, the finished art is done in conventional media. It’s much richer and more expressive than most computer art and, I’ll bet, more fun to create. David Ezra Stein clearly gives in way too easily under pressure from assertive small-animal protagonists. I recommend desensitization therapy, starting with a five-pound Yorkshire Terrier and working his way up. Until then, I hope the picture-book world will continue to reap the benefits of DES’s own unassertiveness. 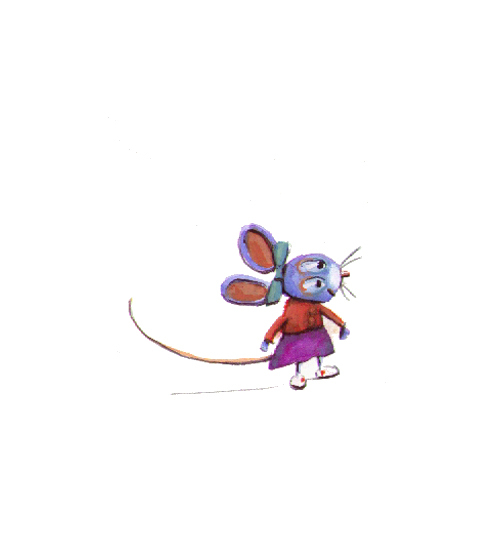 Mouserella looks sweet-and-funny as heck! As usual, Denise, when I read your kicks I think: Yeah. I can see those being MY kicks, too! Well, except maybe Cirque du Soleil, the appeal of which has always, er, gone over my head. Hadn’t seen the Gervais/Neeson bit before, Adriienne — thanks. What a HOOT! Ditto what Jules said about your robbery “kick,” jone. So good to see you turning it INTO a kick. 1. Thanksgiving (the holiday and the act and just the very notion — hence, now that I think about it, the weekly Sunday kicks here). 2. News that (knock on wood) my brother and I shall become great-uncles in May. 3. Saw Super 8 last night, finally. Enjoyed every minute of it, for all kinds of reasons. Loved the blend of E.T. and Stand By Me, mixed with a completely plausible cast of characters and funny, tender romance. 5. We’re getting close to the end of the home improvements we’ll be able to afford for a while. I am sooooo sick of having workers and tools and ladders and dust and tarps around the house. And at the same time sooooo happy with how it all looks. 7. The turkey sandwich which at the moment whispers sweet plaintive entreaties in my direction. It longs for the dark bliss of obliteration, and I am about to ease its pain. Great interview! This book looks so tender, lovely and funny. Can’t wait to get it. 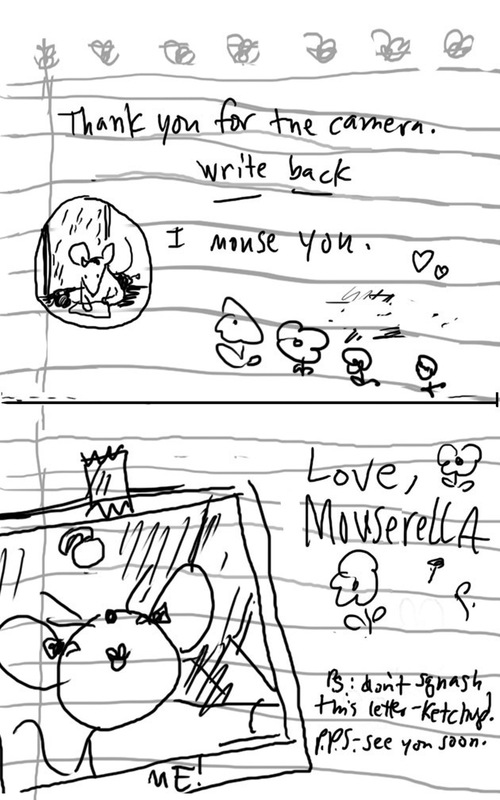 I feel sad for Mouserella. 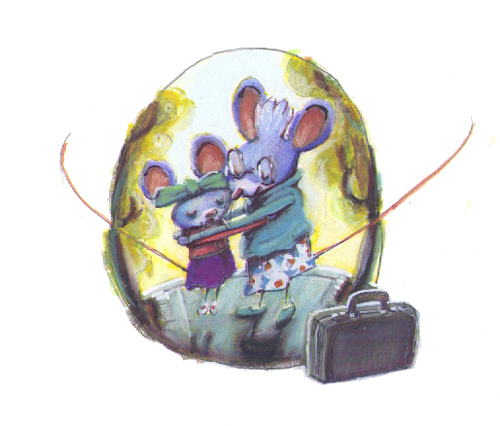 Why can’t she and Grandmouse live together? :o( But that’s a great comic introducing the book! Jules, here’s to your kick #6!!! Hello, Mouserella! Hellow, David Ezra Stein! I enjoyed the backstory. Thanks for sharing. Jules and Denise: I am so happy to hear that the film lives up the book! I really liked the book. 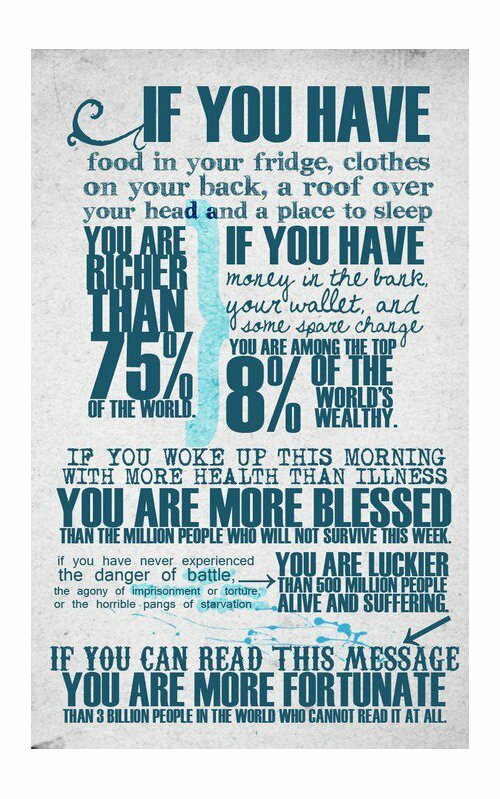 Jules: Thank you for sharing that image/message to remind us all what’s really important, and what true fortune is. Colleen: Congratulations! I hope the book fair is a wild success. Adrienne: Improv with smart people with great timing makes me happy. Jone: Oh my goodness. I am glad that everyone is okay. How scary. Be safe! JES: Thumbs up for the song Crazy! Happy week, everyone! I look forward to seeing “Hugo”at a future date. I want to comment on all the kicks and add my own small joys, but just can’t work up the time and organization for such. But want to say that you, Jules, and your so-wonderful company give so much to be grateful for in this gratitude-giving season, so thank you. You’re such a great part of Sundays! YOU GUYS, I haven’t sat down once today — well, not since leaving my last comment, but a) we got a Christmas tree up and b) it was great to sit down and read the final kicks all at once. Tarie, congrats on presenting! And meeting such talented authors. I want you to be my host one day and introduce me to Filipino food. Little Willow, are you rehearsing for more than one show at once, as usual? Break a leg, as always. Farida, quiet. Ah. I echo your kick #5. I’m also eager to see December. Jeannine, well now. Thank you so much. Very kind to say. What a fabulous blog, Jules! Thanks so much for sharing Ezra Stein’s glorious book with us all. You have a new follower and keep up the fun, great work!